I am very excited to write about sapphire because it is the stone I use most in my work. The incredible sparkle and virtual rainbow of color choices make it a pleasure to design with. When thinking about sapphire, the color that most comes to mind is blue. ‘Sapphirus’ means blue in Greek. September’s birthstone can be a deep, velvety blue like an evening sky or the ocean at dusk, to the vivid blue of the sky on a clear summer day. We associate the color blue with peace and harmony. Like diamonds, sapphires are given to strengthen love and trust. It is the stone most associated with mutual understanding and faithfulness, making it a popular choice for engagement rings. At the moment I am on the hunt for the perfect sapphire for this very reason! Yesterday I held a gorgeous 1 carat Ceylon blue sapphire, remarkable to say the least. Today I was in awe when I saw these beauties, each over 2 carats. One is velvety, the other bright and I adore them both. I will keep you posted on the ring’s progress, of course it is a surprise so keep it a secret! Blue is by far sapphire’s most popular color, however; only one of it’s beautiful hues. The palette ranges from bright pink and mandarin orange [a personal fave], to pale green, lilac, vibrant yellow, and luscious red [that sapphire is called ruby- another story and month all together.] I use all the colors. I find each one unique and inspiring to create with. My newest ring showcases sapphire in blues and greens, it also has a special story. While my parents were on vacation in Italy my mother bought a stunning souvenir from a shop on the famed Ponte Vecchio in Florence. 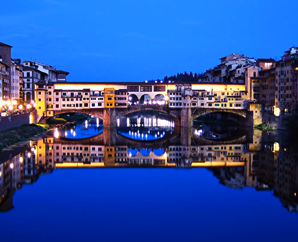 This medieval bridge spanning the Arno River is renowned for the best goldsmiths in Italy. My brother, sister and I were very young and it was the first time my parents had gone away together since their honeymoon. My grandmother took care of us and as a thank you my mother gave her the souvenir – a beautiful ring. I based the design on the structure of the original ring. Rather than 18k gold, my interpretation is in silver and set with cool tones, pale green and deep blue sapphire. The cluster of gemstones in the center resembles a flower. I love how tall it sits on your finger. Che bella! I hope all you September babies had a very happy birthday. Perhaps a gift of sapphire was something you received? I am amazed at the ring pictured. My grandfather was a jeweler and he designed a ring for me, I was quite young so it is simpler. The ring has a 5 petaled flower with 5 sapphires in the center, close to what is pictured. Yes, it is my birthstone. Just had to share!.